COLUMBIA, Mo 9/10/14 (Op Ed) -- I went to the Mayor's anti-violence forum Monday and sat in the back of a standing room only crowd at the Columbia-Boone County Health Dept. Amidst talk of building trust, and kids need to play outside without fear, and police need to build a better relationship with black folks, I spied this lady cop. I'm doing the old eyes up and down thing, from her black shoes to her blonde hair and back again, while I'm listening to talk about building trust and "bottom-up" leadership and how to mentor young kids and how this culture of guns and violence seems to be everywhere. From the neatly-ironed crease just above the young police officer's shoes, my eyes stop at some kind of gun-like thing hanging on her leg. She's average height, a slender woman, and this gun-like thing -- maybe a Taser -- is pretty big, so at first I thought it was holstered with another officer standing next to her. But I looked and looked again and no -- it was definitely hanging -- almost drooping -- from just above her knee. Kansas City Mayor Sly James was speaking at this point, about an anti-crime program in his hometown built on relationships between police and residents. It's reduced murders to 1968 levels, he explained. People aren't afraid to talk to the police, to report crimes, to turn in bad actors. The "no-snitch" culture is no more -- or at least, that's what Kansas City is working toward. 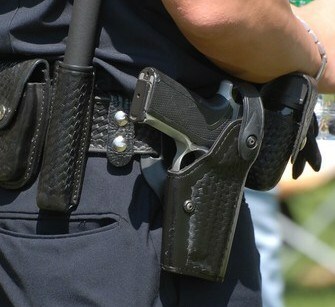 As my eyes rose, I saw what looked like another gun, in a holster around lady cop's waist -- a sidearm maybe, with real bullets -- and just above it, what looked to be a black night stick, a metal baton police use to subdue unsavory elements. Holstered around her waist: one, two, three, four maybe, snap-in holders of some sort. For mace? Bullets? Above that, over her chest, some kind of black box thingy with what looked to be a lightning bolt on it (a company logo? ), maybe the new cameras cops are wearing now. She had a cord curled around her neck too, attached to a speaker/microphone. Probably a police radio, for calls to HQ and such. Pastor and journalist Carl Kenney was speaking now, about how crime lives at the "juxtaposition of privilege and neglect" and how reducing the void where privilege meets neglect requires a "bottom-up" approach built on trust. The CEO of Duke Power, the president of Duke University, the Mayor of Durham -- all the local leaders stopped talking and just listened, Kenney explained, about a successful violence reduction strategy in his former North Carolina home. They served us and listened to what we wanted, he said. Kenney is an eloquent man with a common-sense vision of right and wrong. I didn't take my eyes off him until he sat down. When I looked at lady cop again, I remembered those old "Are You A _________" posters that had pointers to the stuff you wore. 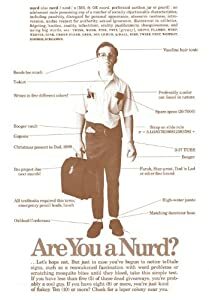 "Are You A Nurd?" had pointers to pocket protectors and a TI-55 calculator in a pocket and a slide rule around a belt and of course, nerd glasses. I thought about all the pointers an "Are You a Cop?" poster would have. Then I got distracted again, this time by people gathering into small groups to talk about building trust and how kids need to not feel intimidated by police officers. I heard people say "we need to do more community policing" and "neighborhood relationship building" with law enforcement. I forgot about the young police woman until I wanted to pass her to listen in on a discussion. I went to tap her shoulder to slip between a man in a chair and her -- and the gun, the taser, the baton, the holster, the holders, the camera, the radio, the cord. I decided it would be easier to just go around.